After a few days during which our very hot summer gave way to intense and seemingly-random rain, we are back to sunlight and hot days. Fortunately we Dominicans have a few weapons in our arsenal to help us survive the heat. Guarapo de Piña (Fermented Pineapple Juice) is one of our favorites. Fermented drinks are not uncommon in the Dominican Republic. I’d dare to say that they are rarer now on account of the myriad carbonated drinks on the market (because let’s face it, even if they are not the healthiest drinks they are very darn refreshing). Having turned my back on carbonated drinks a long while ago, hopefully for good, fermented drink is a great way to satisfy the craving for “bubbly”, cold drinks. It is also cheaper and much healthier. If you find the idea of drinking fermented fruit drinks somewhat-off-putting, let me put your mind at ease: Dominicans have been drinking mabíes and guarapos (fermented root drinks and fermented fruit drinks) for a long time. Give it a try, trust me, it’s worth the effort. Another good thing about this drink is that you only use the pineapple peel; you can use the rest of the pineapple in other dishes, or add frozen pineapple cubes to your drink to keep it cooler longer than with just ice, then you can eat the fruit once you finish your drink. Guarapo de Piña Recipe (Fermented Pineapple Juice): a bubbly, ice-cold pineapple drink just screams "tropical summer", wether you are in the tropics or not. Place the pineapple peel in a pitcher big enough to fit the water and peel. Cover and leave outside until you notice some froth on the surface. Refrigerate for 3 to 4 days, or until you notice bubbles stuck to the sides of the pitcher. Strain and pour the liquid into another clean pitcher. 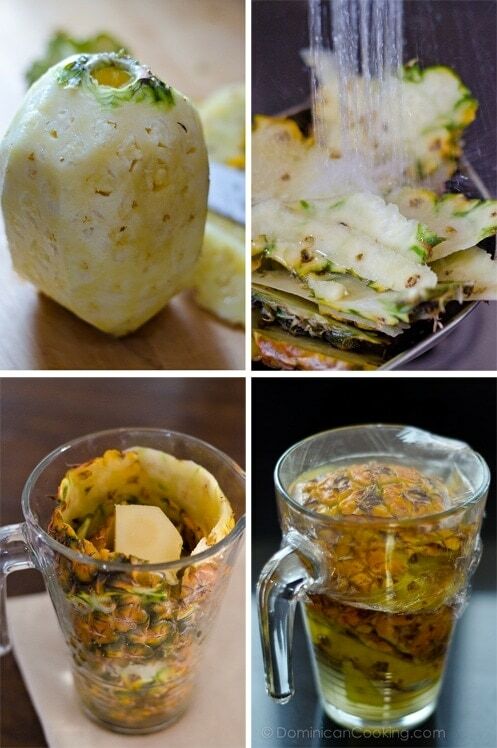 Add sugar to taste, ice and frozen pineapple cubes (optional). For some extra fun, dice and freeze the pineapple flesh to add to the drink, or try other fruits (watermelon, melon, mango) too. NO! That is not normal. If it grew mold in the fridge in just one day, it means the pineapple wasn’t good to start. Throw it away. frequently in a green drink… have never had any negative results!! Is it wrong it I add the sugar first? Will it still ferment? what about the chemicals ? they cannot be rinsed from the peel!